What is a Klystron Amplifier? The klystron amplifier is a device used to amplify microwave frequency signals that reach high stages of power gain by applying the principles of the vacuum tube as well as the electron bunching concept. The UHF region range of klystron amplifier ranges from 300 MHz-3 GHz to 400 GHz. These can be applied in different types of industries like satellite, TV broadcasting, medical, radar, particle accelerators, etc. The working of Klystron can be done by the following steps. The electron gun in the klystron generates electron flow. The speed of electrons will be controlled by the bunching cavities so that they can enter in bunches at the output of the cavity. The group of electrons stimulates microwaves in the o/p cavity of the amplifier. The flow of microwaves into the waveguide moves them to the accelerator. Finally, the electrons will be absorbed in the beam stop. These amplifiers are energetic microwave vacuum tubes & modulated with velocity used in some kind of radar systems. 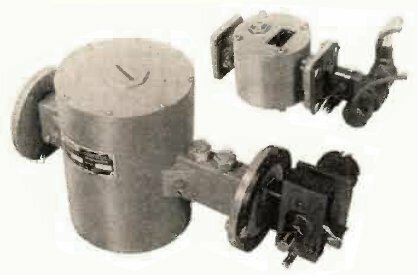 These devices make use of the effect of transfer time by changing the velocity of the electron beam. A klystron amplifier consists of one or several cavities. A klystron amplifier includes one or more cavities which play an essential role in the klystron tube by controlling the electrical field in the region of the axis of the klystron tube. These are categorized into two types depending on the cavities which include the following. These types of Cavity Klystron Amplifiers include various cavities used for controlling the electric field in the region of the axis of the klystron tube. A network is arranged in the hub of multi cavities to let the flow of electrons. Here, the primary cavity by the pairing device is called as a Buncher whereas; the next cavity by the pairing device is named as a Catcher. The direction of region changes by the Buncher cavity frequency, so that the substitute hurries and slows the beam electrons flowing throughout the networks. The external space of the Buncher networks is named as the drift space, which can be created with the electrons in this region when the quick electrons pass the electrons which flow slowly. 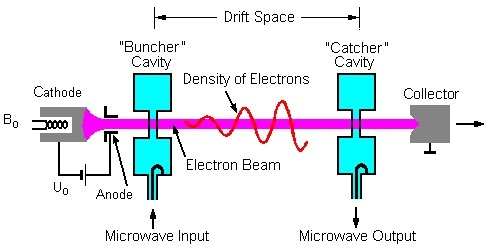 The main function of the catcher cavity is to take up energy from the beam of the electron. The catcher networks are arranged with a beam, at a position where the Bunches are completely produced. The position is decided with the transfer time of bunches at the normal radio frequency of the cavities. The collector gets the power of the electron beam as well as changes it into temperature & X-radiation. An extra cavity among the input as well as output cavities of the fundamental klystron can enhance the output power, amplification, and efficiency of the klystron. Additional cavities provide velocity to adjust the electron beam as well as produce enhanced energy which is accessible at the output. Reflex klystron is invented by Robert Sutton, so another name of this klystron amplifier is Sutton tube. It is a low power tube and works as an oscillator. This amplifier is mainly used as an oscillator within a modulator of radar receivers as well as microwave transmitters. However, these devices are substituted with semiconductor microwave devices. In this kind of amplifier, the flow of electron beam will be throughout an only resonant cavity, and the electrons will be energized with an electron gun into one part of the tube. After letting using the resonant cavity they are reproduced with a negatively stimulated reflector electrode intended for another pass throughout the cavity, where they are then collected. Whenever the beam of an electron is flowing throughout the cavity, it is called velocity modulated. The electron bunches assembling takes place in the flow space among the cavity as well as a reflector. The voltage on top of the reflector should be adjusted so that the electron bunching will be at highest because the electron beam comes back to the cavity, thus verifying a highest of energy will be stimulated in the cavity from the beam toward the RF oscillations. The voltage of the reflector will be changed a bit from the most favorable value, which effects in a variation of frequency, and output power loss. This outcome gives a benefit for automatic frequency controlling in receivers & in frequency modulation for transmitters. The level of modulation which affects communication is little sufficient that the output power fundamentally remains stable. There are regularly several sections for voltage of reflector where the amplifier will swing; these are specified with forms. The electronic modification range for the amplifier is generally denoted by the frequency change among half power points. These power points will be in the form of oscillating where the output power is half the highest output in the form. This amplifier will be changed in several applications with the current semiconductor technology. The difference between the two cavity klystron and reflex klystron include the following. The two-cavity klystron is the simplest klystron tube. It includes two microwave cavity resonators namely the buncher & the catcher. This klystron can be used as an amplifier. Reflex Klystron is a single cavity apparatus. Reflex Klystron is utilized as an oscillator. The name of this klystron is taken due to its reflex act of electron beam. This klystron is totally dissimilar from cavity klystron because it has a single cavity and used for modulation otherwise demodulation. The klystron amplifiers applications include the following. The applications of klystron amplifiers involve in satellite, high-energy physics, wideband high-power communication, radar, medical, particle accelerators, etc. Klystron amplifiers can produce far superior outputs of microwave power compare with Gunn diodes which are named as solid-state microwave devices. Thus, this is all about klystron amplifier, types, differences, and their applications. From the above information finally, we can conclude that these amplifiers are velocity-modulated as well as high-power microwave tubes. These are used as amplifiers in radar equipment. These amplifiers make use of an effect of the transfer time by changing the electron beam velocity. A klystron contains one or several cavities used for modulating the electron area in the region of the axis of the tube. Here is a question for you, what is the function of a Klystron Amplifier?